SAN FRANCISCO, Nov. 15, 2018 /PRNewswire/ -- WW (NASDAQ: WTW), a global wellness company and the world's leading commercial weight-management program, today opened a new expanded office in San Francisco with a celebratory ringing of the Nasdaq Stock Market closing bell. The new SoMa office will house approximately 50 members of the WW Product and Technology teams with capacity to grow up to one hundred. The San Francisco team is responsible for continuing to innovate the WW Digital experience, which includes a highly-rated app that has helped the company to achieve record level member and retention levels in 2018. 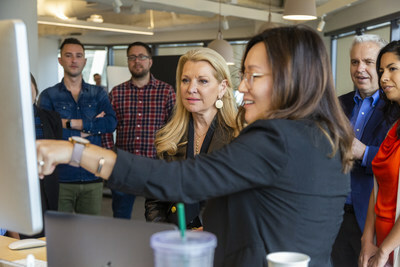 WW President and CEO Mindy Grossman and CFO Nick Hotchkin meet with members of the Product and Technology teams in the new WW San Francisco office. 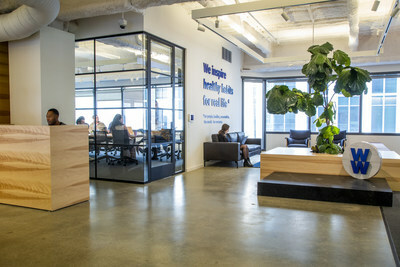 WW's new office space in San Francisco's SoMa neighborhood. 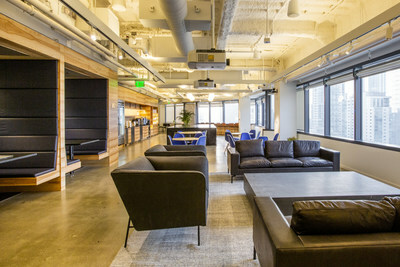 WW's new expanded office space in San Francisco. "On our journey to become the world's everything app for wellness, we are science-led, technology-enabled, and community-centric," said Mindy Grossman, President and CEO, WW. "As we continue to innovate to make our experience more personalized and valuable, the growth of our team in San Francisco is paramount. This new space brings our new brand to life beautifully with room to add the talent we need to live up to our purpose." The WellnessWins™ program rewards members for building healthy habits such as tracking meals, activity and weight, as well as for attending WW Wellness Workshops. Members have the opportunity to earn "Wins" that can be redeemed for a range of exclusive products, services and experiences. Mindset is an essential part of overall wellness, and WW has formed a partnership with Headspace, a global leader in meditation and mindfulness, to deliver currated content for the WW app. Connect Groups are a new way to strengthen WW's community with groups based on Food, Life Stages, Wellness Journey, Activity, Mindset and Hobbies within the WW app. WW is launching Voice Integration with Amazon Alexa and the Google Assistant, which will enable WW members to use their voices to engage with WW app. "Our new San Francisco office is an inspiring work environment with physical spaces designed to spark collaboration for our talented teams and deliver innovative solutions to serve our members," said Michael Korcuska, Chief Product Officer for WW. "Many people don't immediately think of WW as a modern technology company, but we have millions of members using our app every month in a growing subscription business that many tech companies would love to have. Our members are getting results and love our app, which is reflected in our strong ratings in the Apple and Android app stores. WW is a great place to work if you want to make a positive impact on the health and wellness of millions of people and work with leading technologies and a large set of interesting data." The new WW office located at 301 Howard Street is home to key team leads, including Michael Korcuska, Chief Product Officer, Rodrigo Oliveira, SVP of Engineering, Vlad Margulis, VP of Product Design, and Jezmin Fuentes, Product Manager for Community. The open office was designed by Amy Howell of Forge Group NYC with Huntsman Architectural Group of California to allow for a seamless flow between the social and work spaces with the guiding vision to promote wellness, community and collaboration. Features include a 30-foot-long communal table, meeting rooms with adjustable configurations to optimize efficiency and use of the work areas with height-adjustable desks situated along a wrap-around window line to ensure all employees benefit from daylight and outside views. To commemorate the Company's recent transfer to The Nasdaq Global Select Market and the opening of the new space on Howard Street, President and CEO Mindy Grossman along with the WW San Francisco team rang The Nasdaq Global Select Market closing bell from the Nasdaq Entrepreneurial Center. Location: 301 Howard Street, 15th floor, San Francisco, Calif.
1 *Comparing digital members who tracked weight 6 months after starting WW Freestyle vs. digital members in the same time period on the prior program in the prior year.